Behold the "homemade beef burger with cheese and caramelised onions"! The patty is thick, moist and full of beefy, savoury juices! This platter of deliciousness comes with crispy hot fries and a nifty side salad, complete with black olive, sweet white onion ring, splash of olive oil and balsamic vinegar dressing. All that for only S$12! Notice a change in the photos today? Camemberu is celebrating its first anniversary with an "upgrade"! DSLR food photos! I'm also rewarding the blog with its own domain name - Camemberu.com - but you can still use the old Blogspot URL since it's just a masked domain name. I want to thank those who have been visiting regularly and given me such encouraging (and oftentimes funny) remarks in the comments. Some of you have become friends, even though I have yet to meet everyone in real life. 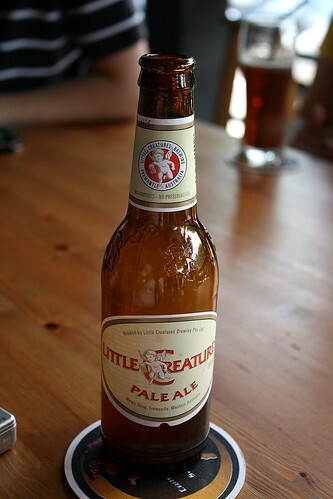 Here's a virtual beer for all (OK, Muslim friends and teetotalers get an invisible Coke)! 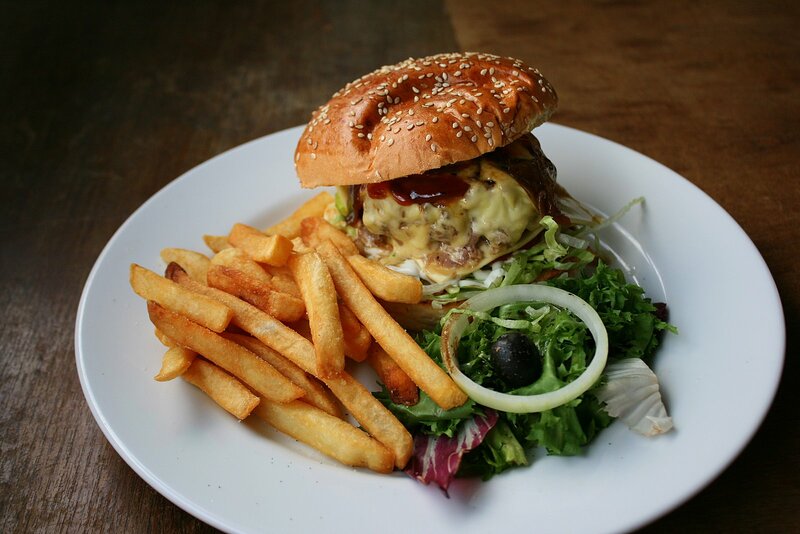 But back to the food - where can you get this awesomely delicious burger? Take note of this name - the Smok'inn Frogz Kitchen! Tucked behind a bar quaintly named "Bar Bar Black Sheep" in a corner kopitiam at Cherry Avenue (close to Sixth Avenue). This is one of southernoise's favourite haunts, and we went there with Keropokman, Jaime, Jac and Jos. We had a lot of fun as southernoise also took his DSLR out to play and he gave us some tips. They've got lots of other dishes too, all featuring generous portions. 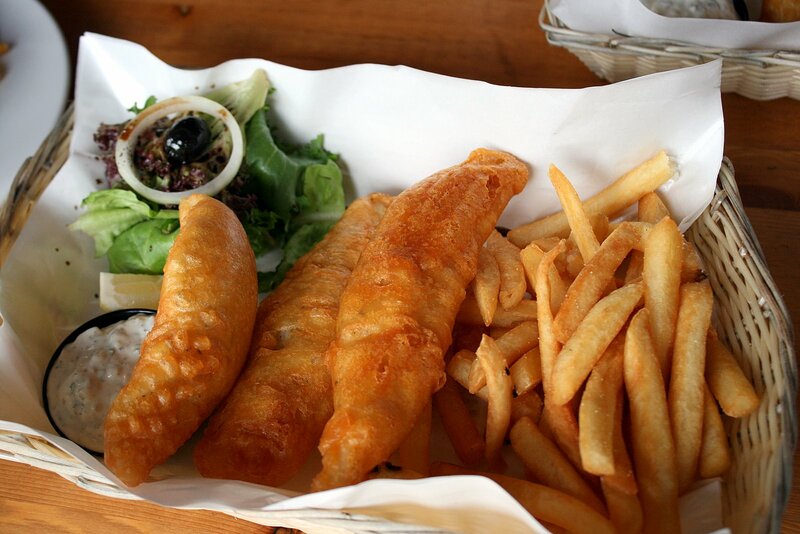 The beer-battered fish (S$12) gives you three large slices and a boatload of fries, along with the side salad. The fish is fresh but the batter, although crisp, is a little thick and oddly has a hint of banana fritter scent in it. Have the Malay chefs been secretly frying "goreng pisang" in the oil before this? Haha! 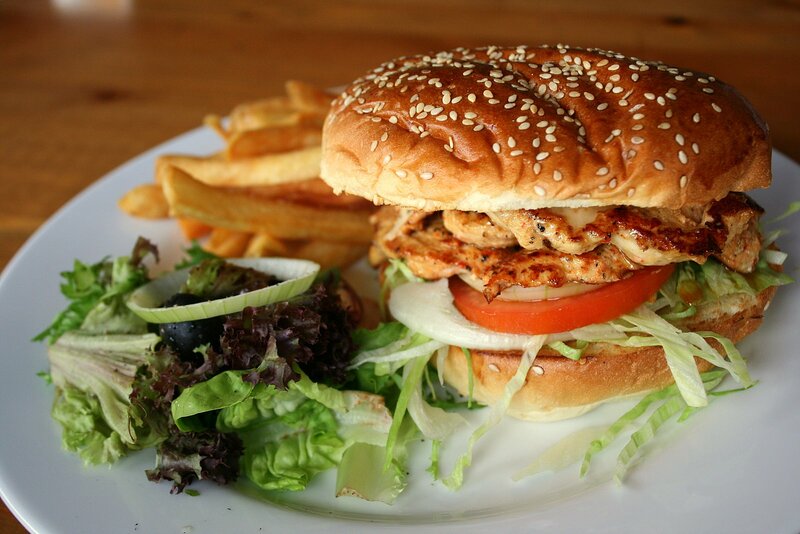 The other burger, for those staying away from red meat, is the chicken burger (also S$12). Slices of well-caramelised grilled chicken doused with a Thai-style sauce, sandwiched between soft, lightly toasted sesame seed bun. Honestly, the beef burger is way better and worth all the cholesterol, purines, saturated fats and whatever else evil that lurks in red meat. Just go for it! 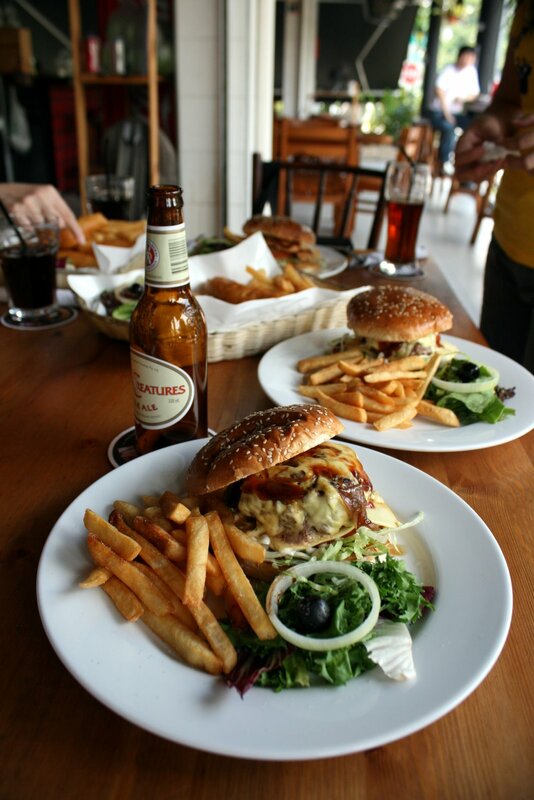 Actually almost everyone of us wanted the beef burger but that would leave us with very few dishes to shoot. 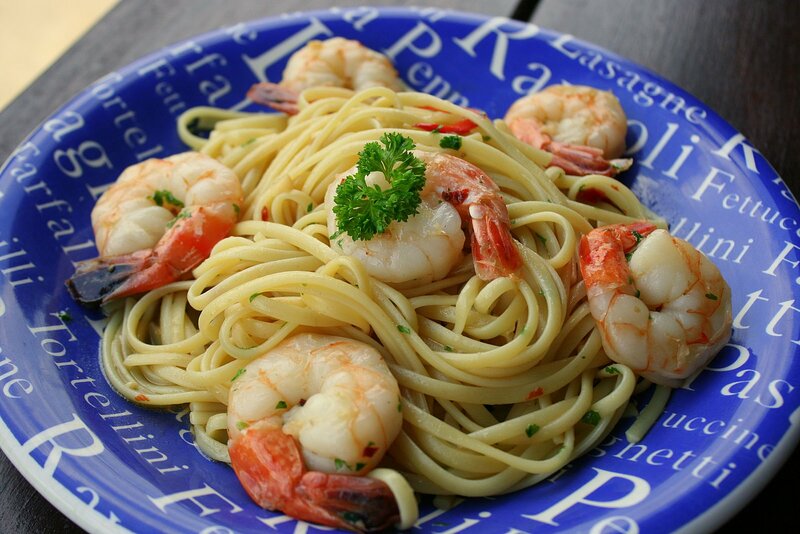 So we picked a few other dishes, I chose the prawn linguini (S$14). It is really good value-for-money, what with six huge, crunchy prawns. But I do like my food a bit stronger in flavour, so personally I would have used more garlic, salt, pepper and chili. Thank god I packed home the beef burger for hubby - it was so juicy and delicious, I wolfed down half of it! Hubby liked the caramelised onions but not the sauce though. Good patty nonetheless. 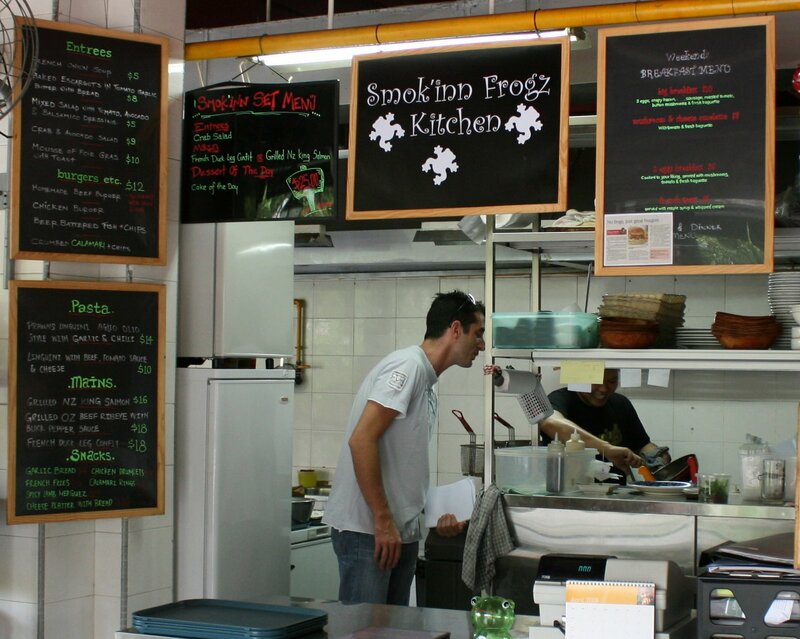 I had been wondering why the stall is called Smok'inn Frogz, until southernoise told me it's owned by a Frenchman. Ahh! Makes sense now. There he is in the kitchen with his jolly helper. They are all very humble and friendly. You can click on the photo to see a bigger version for the menu details. No service charge or GST here. Apparently it's been a little crowded in the evenings ever since the Straits Times did an article on Smok'inn Frogz Kitchen. This hidden find is getting more and more exposed. But it's hard to keep a secret on a good eatery. Go to Keropokman's blog to see more yummy close-up pics! Southernoise first blogged about it back in 2007 but now has photos here. 9am - 11pm (Sundays) - I think breakfast is served. More tasty bites on the owner of the place here. congrats to yr new dslr. the photos look great! ah... your sifu was good eh! maybe u should go take your sifu's ramen too! I like the food shots, very natural lightings. The food sure looks good and reasonable. But it's a pity I seldom get to venture to the west side of the country. Congrats on your 1 year anniversary and having your own domain as well! Seems to be that a number of food bloggers been jumping on the bandwagon - yours truly included. oh the Chef is from Flutes at the Fort! LIC: Haha, how I know you stay near Bukit Timah! Didally: yeah, me too, so rarely go west. The cab already cost more than the burger! Amanda: Thanks! Not as pretty as your cakes and bakes though! LCOM: Wah you already have a good DSLR camera there! I'm sure hubby can share with you! And tips too! Ice: Wow, you even know and track chefs?? Impressive! Congratulations For one year Domain name super mm go..I registered My Domain name before one year in tucktail.com..
is this the best burger in Singapore?